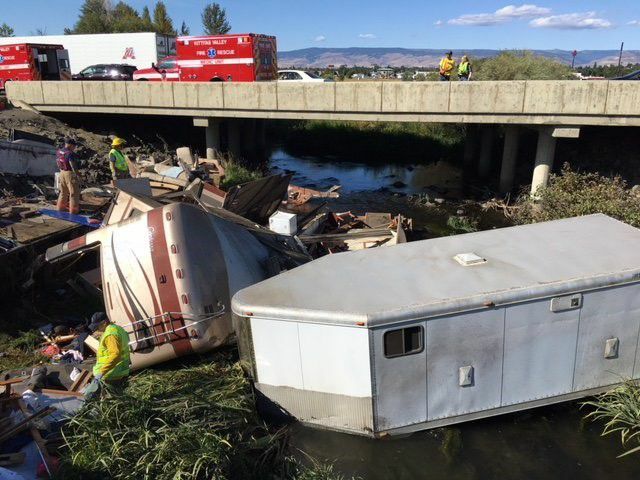 Two people were killed and six others were critically hurt in a motorhome crash on Interstate 90 near Ellensburg on Monday, according to the Washington State Patrol. The incident occurred around 3:30 p.m. on westbound I-90. The 40-foot motorhome and trailer suffered a blown tire and the driver lost control. The motorhome went off the road and into a median, down an embankment, coming to rest in a creek. A 61-year-old Snohomish man and a 6-year-old girl were killed. Six other passengers were airlifted to either Harborview Medical Center in Seattle, Kittitas Valley Hospital in Ellensburg, or Virginia Mason Hospital in Yakima. A 3-year-old boy was the only passenger not injured. The driver of the motorhome and a 15-year-old boy were the only ones wearing seat belts. The roadway was mostly blocked for the investigation. All lanes reopened around 8:30 p.m.
A quick Google search shows just how prevalent blown tire accidents on recreational vehicles are, particularly one brand of tire. Some older Goodyear motorhome tires, the G159 tires manufactured between 1996 and 2003, have led to at least 40 legal cases over the past 10 years. Further, the National Highway Traffic Safety Administration has begun looking into whether roughly 40,000 Goodyear motorhome tires still in use may fail and cause potentially deadly crashes. A lawsuit filed by an Arizona family claims that the Goodyear tires caused a devastating crash in 2003. It goes on to state that there were at least 98 death or injury claims and well in excess of 600 property damage claims caused by the G159 failures. Overloaded trailer: If you are exceeding the Gross Vehicle Weight Rating (GVWR is the maximum weight the trailer can safely handle) you may cause suspension damage that stresses and blows out the tire. Improperly inflated tires: Under inflated or over inflated tires are common causes of tire blowouts on RVs. Defective suspension: If the suspension is bad and the trailer is rubbing on the tires, blowouts may occur. Road hazards: Potholes, broken glass, debris, etc. can cause tires to fail. The Statute of Limitations for personal injury claims in Washington state is three years from the date of the accident, meaning that claims must be filed before that time runs out. 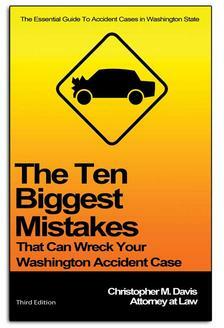 But important information and evidence can be lost or jeopardized almost immediately after an accident. It’s important that you and your family contact a law firm with the resources to begin researching your case and advocating for you ASAP, while you focus on recovering from the accident. For a free case evaluation with the RV accident attorneys at Davis Law Group, P.S., call (206) 727-4000, use the chat feature below or fill out the form on this page to get started.